March 15, 2016 – Engineers at Orion prime contractor Lockheed Martin’s facility near Denver are assessing a new acoustic test method on the space-flown Orion crew module. Direct Field Acoustic testing uses more than 1,500 customized, high-energy speakers configured in a circle around the vehicle. This test simulates the intense acoustic loads Orion will experience during launch and ascent on the Space Launch System (SLS) rocket. 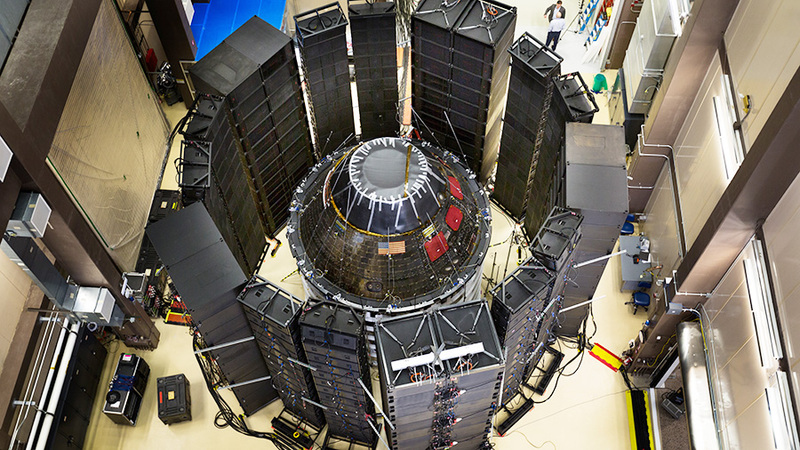 If this test method passes all necessary evaluations it will be used to verify Orion’s ability to withstand SLS acoustic loads during its next mission, Exploration Mission-1, expected to launch on SLS in 2018.